A century and a half ago, a sudden Catholic ascendancy arriving in droves on these shores found itself welcomed to America not with warmth and goodwill, but persecution and paranoia – their churches were burned, their ministers mocked... and above all, widespread fear circulated among the elites that the mass migration was born not out of a quest for freedom and prosperity, but decreed with an eye to sedition: as the theory went, the newcomers had been ordered across the Atlantic by Rome to populate the country, seize the reins of government, and complete their "takeover" by installing the Pope in the White House. Across the long arc of history, at least some things change for the better. Even so, as the 266th Bishop of Rome becomes the first pontiff to ascend the rostrum of the House Chamber on Thursday to address a joint meeting of Congress – a moment capped by an appearance before crowds outside the Capitol's West Front (indeed, the very spot where presidential inaugurations are held) – just because the path that won the day is largely forgotten doesn't diminish its significance. And with it, great as time's progress has been, the nation's full embrace of its 70 million Catholics and their Universal Pastor does not accordingly mean that – both for the Stateside church and a society its ever-changing faithful still dominate in numbers – no unfinished business remains. Against this infinitely rich backdrop, welcome to some of the most intense and meaningful days this beat will likely ever see: a wild ride from the nation's capital to the place Rome has long regarded as the "Capital of the World," then finally to America's Cradle of Liberty, where high hopes for a new birth of freedom loom over this once vaunted, now fallen bastion of the faith, one whose internal failure has succeeded at accomplishing a destruction which, by comparison, makes the past era's torching of our churches seem almost benevolent. The schedule is set, the stages are being built – and, yes, there will be surprise stops added to an already brimming agenda. But for now, all that can wait. In the meantime, amusing as the ongoing game of "Pin the Talking Points on the Pope" might be, the irony of the exercise is that precious little of the speechifying's come from Jorge Mario Bergoglio, himself... and no, putting "Who am I to judge?" on repeat doesn't count. 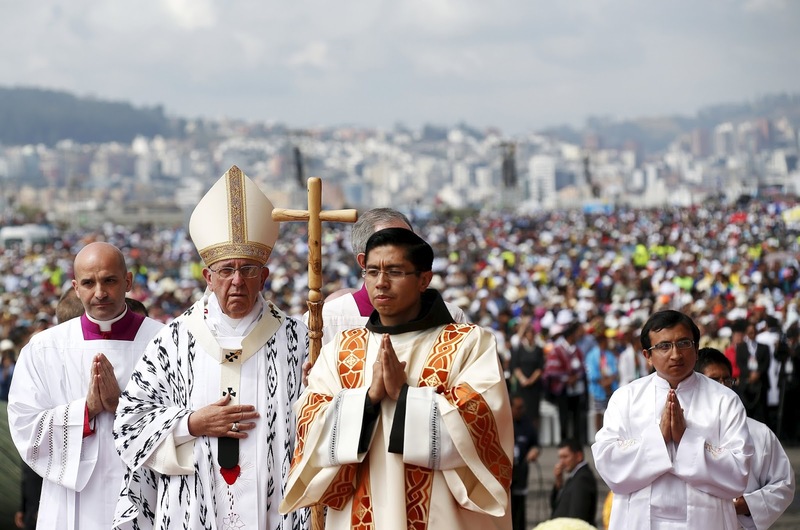 To be sure, there are any number of ways to cover a papal visit, and no lone approach can completely capture the sensory overload of the experience. Still, when you've watched every day of these last 30 months from a specialist's vantage, two elements of the scene rise to the top: image and message, and with it, the space that exists (or is made to) between them. 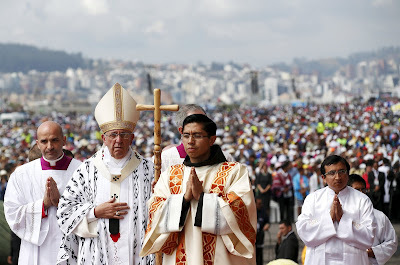 See, for all the stabs taken at parsing him, it bears recalling that the clearest exegete of the phenomenon known as Francis is what created it: the man and his mind... an existence inexorably rooted in and sprung from what, ever the good Jesuit, he ceaselessly refers to as "Our Holy Mother, the Hierarchical Church." 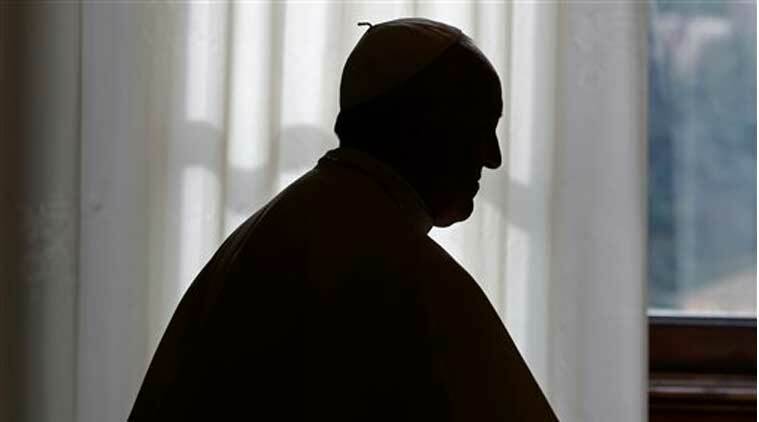 In that light, as curtain-raisers go, the path here leading up to Tuesday's late afternoon arrival in Washington will bring a mini-compendium of the Pope, himself – a dozen moments from the Whispers archives, mostly turning-point talks given in different settings over his pontificate to date, but all of them touching upon the key threads to be raised over the coming nine days before church and civil audiences alike. Allow me, though no one asked me this, to give you five extra minutes, if they are helpful. In your line of work, the interpretation of a text is very important. A text cannot be interpreted through a single statement. The text as a whole has to be understood. Certain phrases are key for that interpretation but others are said only ‘in passing’ or ‘superficially’. So, one must look at the context as a whole, see the situation, see even the historical context. To see the evolution of a situation or, if we are talking about the past, to interpret an event with the hermeneutic of that time. For instance, the crusades; let us interpret the crusades with a hermeneutic of how they thought then. It is essential to interpret an address, or any text, with an interpretation which is comprehensive and not isolated. Along these lines, then, the kicker should be clear: on the eve of his arrival in Washington, you can pretty much bank it that the pilgrim's mind won't be taken up with questions of polarization, protocol or "pelvic issues," but the events of another 21st September, now 62 years ago – the day of the conversion experience which changed the now-Pope's life. For everything else you'll see over these days to come, folks, just be reminded again: miss these things, and you miss everything... because without the core of it all, none of the rest could ever possibly make sense. 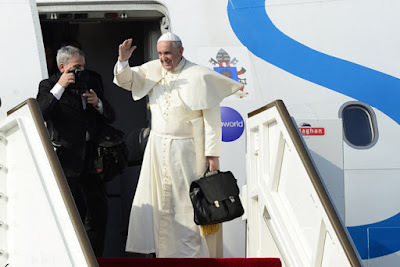 With this tenth foreign journey of Francis' Petrine ministry doubling as his longest, the Volo Papale touches down in Havana at 4pm local time this afternoon. While coverage of the first leg will kick off then, come Monday, Whispers will be in the capital to start running the stops of the three-city US tour – 18 months in the works, the most extensive PopeTrip the States has seen in two decades, all timed to center on the closing of the eighth World Meeting of Families in Philadelphia, as well as to mark and echo the 50th anniversary of Paul VI's 13-hour trek to New York on St Francis' Day 1965, the first-ever papal voyage to North America. As for what'll ensue on these pages, let's just say that the plans are as ambitious as they've already proven to be expensive. To cite the lead example, after more than a decade of covering the Vatican from a house in the "peripheries" of Philadelphia, when The Show finally comes to visit, the security behemoth that's been put in place for it means that this scribe won't be able to cover it from said house... and to be blunt, simply on an emotional level, I was immensely looking forward to doing just that. As ever, all thanks for making the coverage possible... please God, may nothing need to be canceled at this point. Lastly, and most of all, no words could say how much all the prayers, notes, calls and all-around good wishes from a good many of this crowd have meant over these last weeks – it's been a priceless gift in itself. While we're at it, since the most frequent question has been some variation of "So, how excited are you?," well, it's worth keeping in mind how, at this stage of things and when you've lived this enough times, it's not so much "exciting" as simply daunting: facing down the hoops of scheduling, logistics and the curveballs that inevitably arise is always a challenge, and as one of the few ops able to compare this trip's setup with last time put it, the security for the coming go-round is "exponentially, exponentially" more stringent than it was during B16's memorable trek in April 2008. Yet even in those instances when the planning descends into levels of disarray that serve as an embarrassment and prods folks to stay away at the moment when either should least exist, the truth remains that once the day finally comes, it's all beautiful... it always is, because what finally takes center stage is the thing that counts most: "the bishop and people together" – that is, Francis' Election Night definition of this Church at its purest best. With that, the first half of the looming threads are below (in reverse chronology), the rest to follow late in the weekend. So to one and all, Happy Reading, send prayers... and, at long, blessed last, it's finally time – let's just enjoy it, and may the moment bear fruit among us that remains. Que así sea.